Etherium. The newest kid on the well-worn block of competitive RTS’s that will try to bring something new to the already saturated market. Does it? Well, it certainly tries. There really isn’t any hiding developers Tindalos Interactive’s ambitions for Etherium. Most of it works to an extent, but sadly adds up to very little. It’s inevitable, in the well-stocked marketplace of competing titles that comparisons will be well incoming. 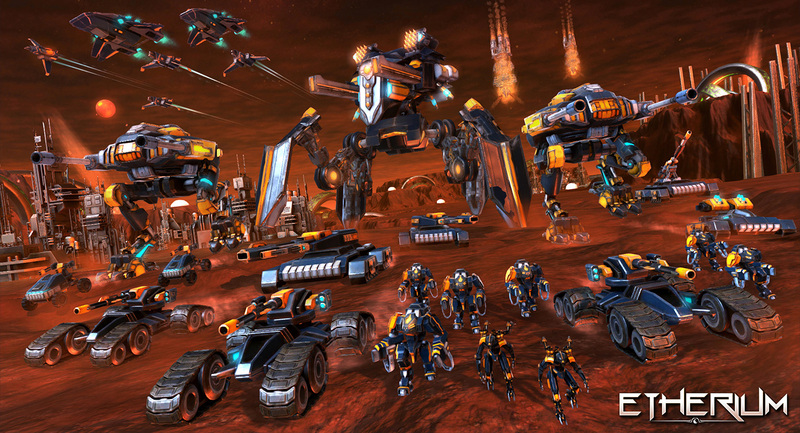 Etherium often was compared to Supreme Commander or Total Annihilation off its pre-release stuff, and it’s not an unfair assumption. Whilst the game does possess some elements that are definitely inspired by the aforementioned titles, Etherium feels more like a Supreme Commanderesque Dawn of War with the overarching ‘Conquest’ gameplay akin to other 4X titles such as Amplitude Studio’s Endless Space. It’s very much a macro over micro oriented experience, as you’ll spend much of your time fiddling with resource management and map strategy rather than dallying with individual units and responses. So much so, that most things are grouped into regiments for convenience, allowing focus to be shifted to where it really matters. Many might argue that the lack of any micro mechanics leave a lot of depth to be explored. Not always true, but unfortunately here it seems to be the case. Matches take place on maps that are divided into clearly defined sectors, each of which has a ‘control point’ of sorts to dominate. 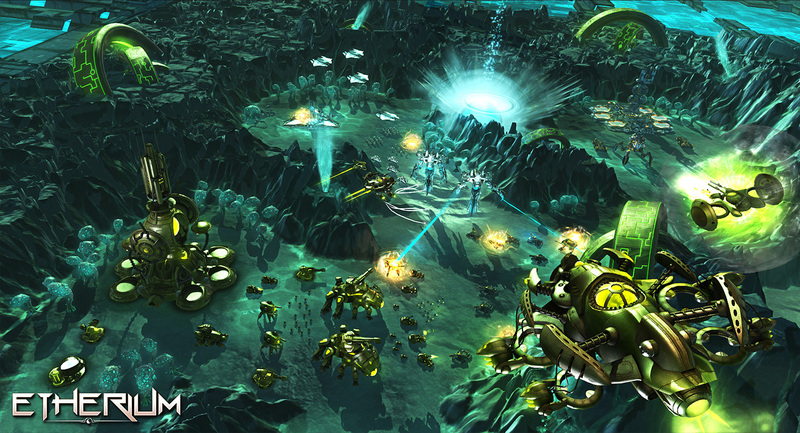 Ground combat revolves largely around this mechanic, as each controlled node in turn allows further expansion in technology and units as well as allowing deployment of forces closer to the frontline. If you’ve played any of Relic Entertainment’s offerings in the RTS market, you’ll feel an overwhelming sense of familiarity. Those looking for Command and Conquer style base building need not apply. Whilst it does seem that Etherium is just another rehash of a tried and true game mode, Tindalos has attempted to put its own innovative spin on things. 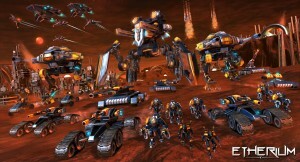 There’s gameplay gimmicks all over that players can fiddle with; most notably the ability to manage relationships with the neutral factions on each map as well as the secondary victory option, which revolves around building and defending orbital cannons that damage and destroy the opposition’s orbital fleet above. Cool features, no doubt, but these often end up feeling rather shallow at the end of the day. The aforementioned diplomacy option is largely just a resource hog, with none of the depth featured in a similar system such as the one found in Sins of a Solar Empire. The overwhelming impression when entering the world of Etherium for the first time is simply a lack of refinement. UI, menus and even the game’s graphics themselves don’t really scream quality. Not to say it’s poor, but there isn’t the same sense of a well made product as, say, Grey Goo which released earlier this year. Etherium won’t be winning any awards in the visuals department, and while it’s understandable as the game isn’t a big budget project, it’s still disappointing to see such a significant disparity in the pre-release promo material and the final release. Despite this the game did run quite smoothly with nary an issue on setup, something that doesn’t come too often in today’s competitive PC release world. It’s just a pity then, that whilst Etherium is a mashup of some of the best offerings in the genre, much of the inspirational elements have lost most of their innovation and charm on the transition over. The result is that Etherium feels largely shallow and vapid, without any real viability. Take the dynamic weather for example. Random, map-specific and overreaching in consequences, it’s a cool idea. In implementation, however, frustration is the only thing that comes to mind. A storm could come in and completely wreck your forces, or decimate the enemy opposition. Perhaps a volcano might explode, crippling your supply chain. It’s a dice roll, and serves not only to randomise the matches and bring unpredictability to each encounter, but also to completely invalidate Etherium in any competitive scene. Furthermore, things that are now considered RTS staple, even essential ones such as certain asymmetry in faction designs are absent here. Similarities I can understand, but when all three playable entities feel like they have only minor adjustments to their gameplay styles and when the art and animations are the largest defining characteristic it’s getting rather sad. Seems like a rant, but there’s a lot of potential here with a lot of cool ideas; just done wrong in the simplest way. However, a striking example of a feature done right is Etherium’s AI systems. Though the game might have missed many a mark in my book, this one is definitely a hole-in-one without a doubt. Most other competing RTS’s feature simplistic AI opponents with repetitive strategy, whereas Tindalos have actually managed to implement something that rivals human intelligence, even being able to react and adapt. It’s some of the most challenging AI I’ve faced yet, and that’s quite an achievement over the bog standard feature of other titles. A small achievement in an RTS meant for online play, no doubt, but it’s noteworthy nonetheless. Speaking of online multiplayer as far as my region (Oceanic) goes, Etherium servers are a rather sombre place to be. There aren’t too many players to be found, and thus far I’ve only managed to get into three multiplayer matches. A disappointing outlook indeed. Disappointed. Probably the best way to sum up my feelings when it comes to Etherium. With such a promising outlook and features from so many successful RTS franchises that have come together it was almost a surefire good time. Sadly, Etherium only just qualifies as a decent time, with plenty of misfires to go with it. A pit stop between other major genre releases. Newcomers might find more to do here, but veterans and those with competitive interests, there are others out there both released and incoming more worthy of your time. Etherium was developed by Tindalos Interactive and published by Focus Home Interactive. It is currently available for purchase on Steam. A copy of the game was independently acquired by the reviewer.